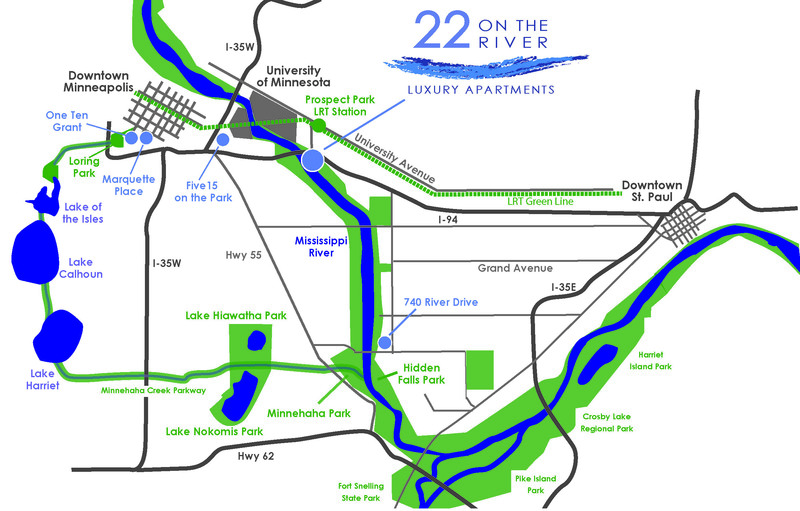 22 On The River is just three miles from downtown Minneapolis and an easy 10-mile drive from downtown St. Paul. 22 On The River has unparalleled access to the Twin Cities regional transportation system. It is close to many major commuting routes, including Interstates 94 and 35W, and Highway 55. This provides convenient access to most of the Twin Cities’ major destinations, including the Minneapolis-St. Paul International Airport, which is just eight miles away. The Prospect Park station of the LRT Green Line, just a few blocks away, provides express and comfortable travel to major destinations in the Twin Cities, and it connects with the LRT Blue Line. The trains of the Green and the Blue Lines can quickly take you to a variety of destinations within the Twin Cities, from the Warehouse District, to downtown Minneapolis and St. Paul and their several professional sports arenas, to the Minneapolis-St. Paul International Airport and the Mall of America.